Select Components → News Feeds → Categories. Once at the News Feeds Category Manager, either select the feed category and click the edit icon on the toolbar, click the name of the category, or click on the "New" icon on the toolbar. 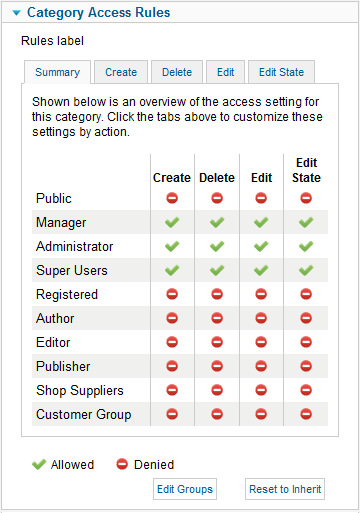 The New/Edit page for the News Feeds Category Manager is a create/edit screen that allows website administrators to create or edit News Feed Categories. Categories allow a broken down structure of News Feeds. You must have at least one category before you can create any News Feeds! Note. A short note about the category. Parent. The parent category if any. State. Select from the dropdown box: Published, Unpublished, Archived, or Trashed. Language. The language of the selected category. Alternative Layout. 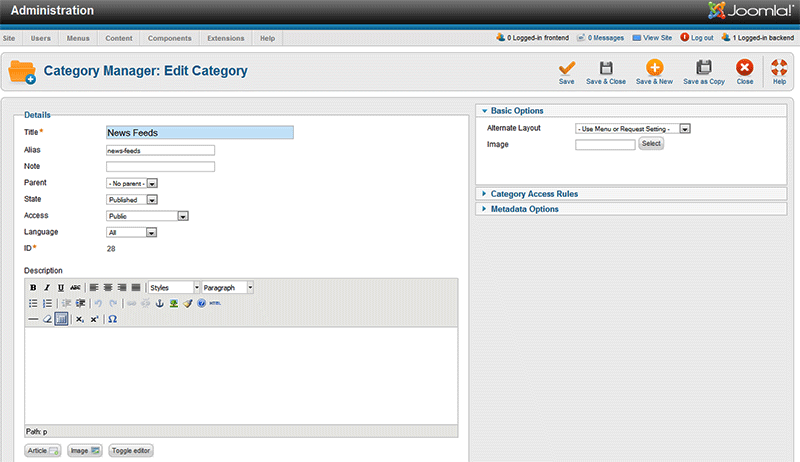 Use a different layout from the supplied componant view or overrides in the default template. Image. Select an image to go ith the category. Summary. 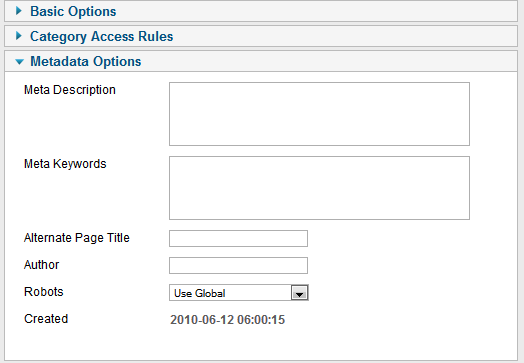 Gives an overview of the access settings for the current category. These may be changed by accessing the following tabs. Create. Shows the inherited state for create actions on this category and the calculated state based on the menu selection. Delete. Shows the inherited state for delete actions on this category and the calculated state based on the menu selection. Edit. Shows the inherited state for edit actions on this category and the calculated state based on the menu selection. Edit State. Shows the inherited state for edit state actions on this category and the calculated state based on the menu selection. For more information, please refer to the ACL Tutorial for Joomla 1.6. Alternate Page Title. This will set the title tag for HTML output. Created. Shows the date the category was created. Save as Copy. Saves the current item as a new item. This button is available only when editing an existing item, not when creating a new one. You must create at least one News Feed Category before you can create any News Feeds.